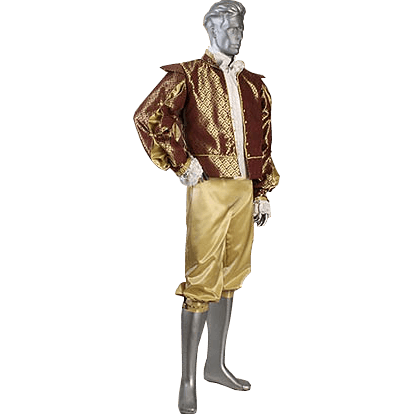 The design of the Damask Renaissance Doublet makes it seem like a traditional doublet from the eras of antiquity. However, the one thing that separates this doublet from its ancestors is the quality of the material and the design it features. This beautiful doublet is made from attractive damask brocade. It features an extremely attractive and incredibly detailed gold and burgundy pattern. Thanks to the material, the jacket glimmers in the light like a thin sheet of gold. This doublet features a low-cut collar that wraps around the neck, as well as exaggerated shoulder-pads that broaden the wearers silhouette. The full-length sleeves are loose-fitted and gathered at the wrist in a narrow cuff. The interior of this modern-day doublet is fully-lined, making it comfortable to wear for extended periods of time. 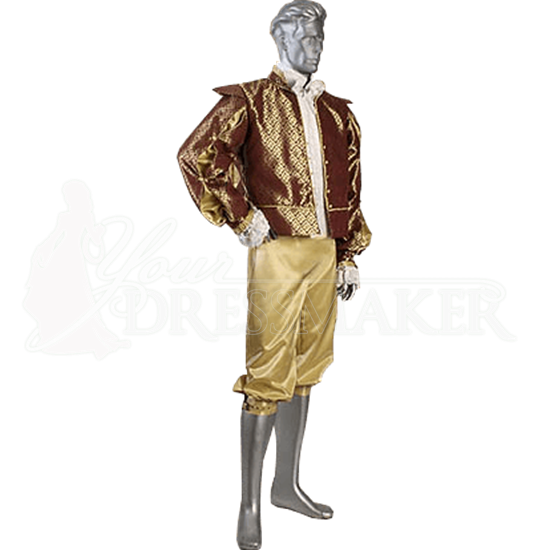 The doublet is pictured above with a renaissance shirt and a pair of knee-breeches, although it should be noted that the doublet does not include either the shirt or the breeches. The Damask Renaissance Doublet is a vivid and eye-catching piece that is sure to make whoever wears it the center of attention. After all, it is quite hard to ignore something that glimmers like gold in the light.